Thomas Edison once wrote that genius is one per cent inspiration, 99pc perspiration. Assuming the inventor of the light bulb was correct in his calculations then, brace yourselves folks, I’m about to win a Nobel Prize here. Last week in interviews promoting the 2018 Rose of Tralee finals, presenter Dáithí Ó Sé revealed he had lost a stone in weight ahead of this year’s contest by (amongst other things) wearing a “sauna suit” as part of his fitness regime. 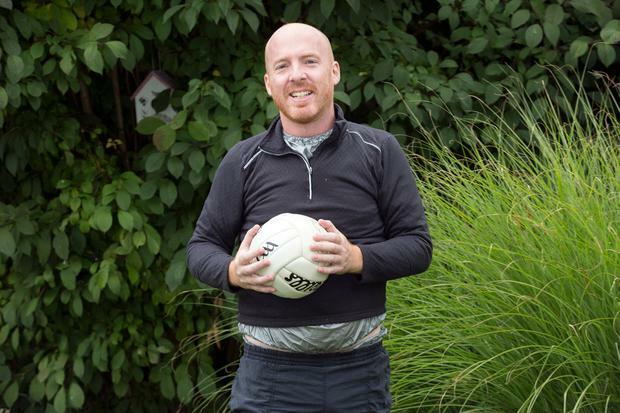 Speaking to the Irish Independent, the Kerryman elaborated: “It’s like a swimsuit. You wear it when you’re out walking. You wear clothes over it.” He bought the item on Amazon. “I just googled it and it came up,” he said. So are sauna suits really an effective tool for losing weight? In online forums, opinions were divided. But, in the photos accompanying these news stories, Dáithí was being pursued through a hedge maze by 57 attractive Roses. My personal highlight that week was receiving a robocall asking if I was happy with my bank. Clearly, I was going to take any guidance I could get from this good man. Ordering off Amazon wasn’t feasible in the available time-frame. So I called Elverys Intersport. They had the item in stock and told me it would cost €20. I’m not sure what sort of high-concept hybrid outfit I was expecting a sauna suit might be. (Where does the wood-burning stove go, for example?) But I rather expected it would cost more than €20. The suit Elverys provided me with seemed less like a swimsuit and more like a cross between a raincoat and a tracksuit. But the store manager assured me this was exactly the product I was looking for. My schedule for the following day was pretty full-on: I would drive from Dublin to Mayo in the morning to help an older relative clear out the attic. Then I’d complete the near 500km round trip back to Dublin for 5pm in order to collect my niece from Art Camp. Next I would have to collect a suit from the dry cleaners before 5.30pm for a wedding the following day. The following morning was mild and overcast. The drive to Mayo was uneventful. A few kilometres outside of Roscommon town, as ever, I got stuck behind a long tailback of slow-moving vehicles. I lost so much time there that when I finally cleared that impasse, I all but shook my silver-clad fist in rage at the driver whose timidness had created the bottleneck. My blood was boiling. The suit was beginning to fill with beads of perspiration. Now we were sucking diesel. In my relative’s attic, the moistening process accelerated at a rate of knots. There were dozens of boxes to be removed, stacked in my car, and restored in another attic at a nearby address. The top book in one of the old boxes I removed was the first ever authorised biography of The Beatles, A Cellar Full of Noise by Brian Epstein. I flicked through its yellowed pages, while a bin-liner full of body fluid was audibly sloshing around my waist. Having, literally, pints of my own hot sweat encased at the waist band and ankles of the outfit I was wearing was, at best, uncomfortable and, at worst, revolting. Hopefully this was the closest I would ever get to wearing a catheter. After an hour or so, my older relative signalled we’d done enough lifting for one day. I pointed out that we hadn’t quite finished clearing out the attic. But she demurred. We’ve done enough, she said, with a grimace that suggested she wanted me and my now bulging sauna suit off her property asap. I couldn’t get back in the car though. If I plonked down on the driver’s seat as was, sweat would shoot out of me like blood in a Tarantino movie. I was literally swimming in my own filth. I took a shower and asked if I could dry the suit out on her clothes line outside. She insisted I throw the suit out her bathroom window rather than carry it, dripping, down her stairs. Re-suited, I sped back to Dublin to collect my niece. I made it in time but, unfortunately, in all of the packing and unpacking, I’d taken the child seat out of the back seat of the car and left it behind in Mayo. I parked at my house and made what Google Maps reckoned was a 27-minute walk to collect Lola in Terenure. The sun was out now. It was a hot summer’s day. By the time I reached her bus stop, cascades of liquid were flowing down my back. And the suit wasn’t as airtight as it had been before I threw it out an upstairs window. Constant trickles of sweat were flowing down my hands. A concentration of leaked material at the crotch of my jeans, meanwhile, conveyed the distinct impression I had just peed myself. Lola was unimpressed. “You look really stupid,” was the verdict. I tried one of my usual fail-safes: offering to buy her an ice cream on the way home. But for once, even blackmail didn’t work. “Can we go home first, and you change, and then we go for ice cream?” she pleaded. Over the weekend, I spoke to Dr Andrew Jordan, Chairman of the National Association of General Practitioners. He poured cold water on the notion of wearing a sauna suit as an effective technique for achieving anything other than temporary weight loss. He asked what my fluid intake was during the day I’d worn the suit. I told him I’d probably consumed four or five 500ml bottles of Ballygowan. He told me I was wise to do so in order to stave off dehydration, but that in doing so, I had effectively re-gained any weight that I had lost. Still, all’s well that ends well. This week’s Rose of Tralee will have a dashing host at the helm. And Dáithí, if you could tell the press next year that you prepped for the competition by taking an all-expenses-paid holiday in the Bahamas, I would really appreciate it! Intersport Elverys stores and Elverys.ie stock a wide range of sauna suits and other fitness equipment.